It's early October and about eleven weeks to Christmas. Some people have started shopping for presents or they shop all through the year whenever they see suitable gifts. There are those who are busy making gifts and others who will leave it until December. If you are on a tight budget you will be keen to save money on presents. Perhaps you enjoy gardening and would get a feeling of satisfaction giving plants you have grown from cuttings. Now is the time to get started. The amount of time it takes for a plant to grow into a sturdy little plant depends on the type of plant, the climate and the weather conditions. My personal gardening experience comes from living in South Australia. At the moment I have some rosemary, lavender and pink daisy plants growing from cuttings I popped into pots of soil about two or three months ago. These would make nice presents but might need to be repotted into larger pots before Christmas so they don't get pot bound. I could plant some cuttings of basil mint, chocolate mint and pelargoniums and they should be sufficiently established by December 25th. Mint can be propagated by taking some healthy cuttings about 8cm in length. Remove a few leaves from the bottom of each cutting and place them in a glass of water. Plant into soil when roots have developed. Alternatively plant your cuttings directly into a pot of damp potting mix or soil. Mint is hardy and new plants usually grow from cuttings without much fuss. Pelargoniums, rosemary, daisy and lavender grow easily from cuttings. 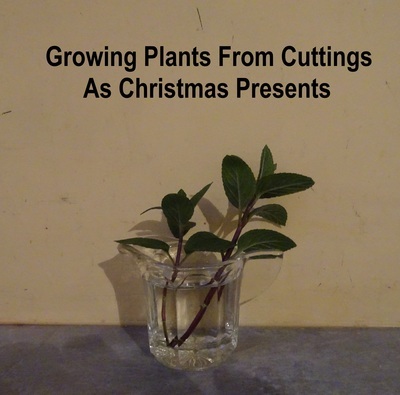 Take a number of cuttings about 10 cm in length. Remove the bottom leaves. Some people like to dip each cutting into water and then into a hormone rooting powder to encourage the cuttings to take root. Other people use manuka honey. Make a hole in soil or potting mix with a pencil and then plant each cutting. Firm the soil around the cutting. I find good success by simply planting cuttings into damp soil or potting mix. The soil needs to be kept damp but not too wet. Plant more cuttings than you need as some will not take root. In my garden I have a number of plants that were given to me by friends, grown from cuttings in their own gardens. Knowing where the plants came from makes them special. I appreciate the time and effort friends put into striking these plants from cuttings.